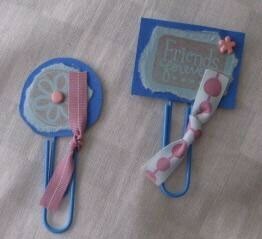 Make your own bookmarks as inexpensive gifts using things found around the house. Cut one piece of paper into a 2 inch square. Stamp design onto this paper or stick sticker onto this paper. Cut a coordinating piece of paper into a 2-1/4 inch square. Glue 2 inch square onto this square with glue stick. Glue entire square onto top of paper clip to create bookmark. Leave some of the paper clip showing so that it can be clipped onto paper. Tie piece of ribbon to paper clip as embellishment.